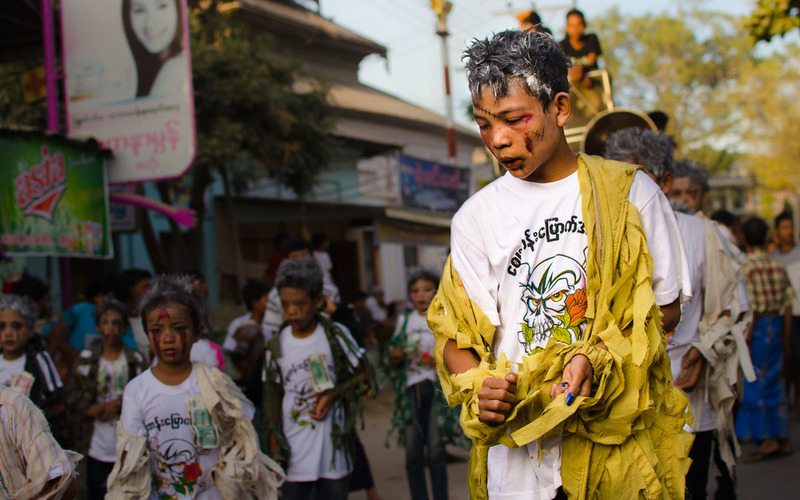 Any other time, and Burmese kids dressed as zombies doing a choreographed number to "Thriller" would have received top billing in this story. It's the Shwezigon Pagoda Festival (Shwezigon Paya Pywe) and there is a small festival area set up in Nyaung U near the famous temple for which the festival is named. It's the usual; a bunch of merchants selling their wares, live singing on the stage, and makeshift tea-shops aplenty. All are well attended through the evening. 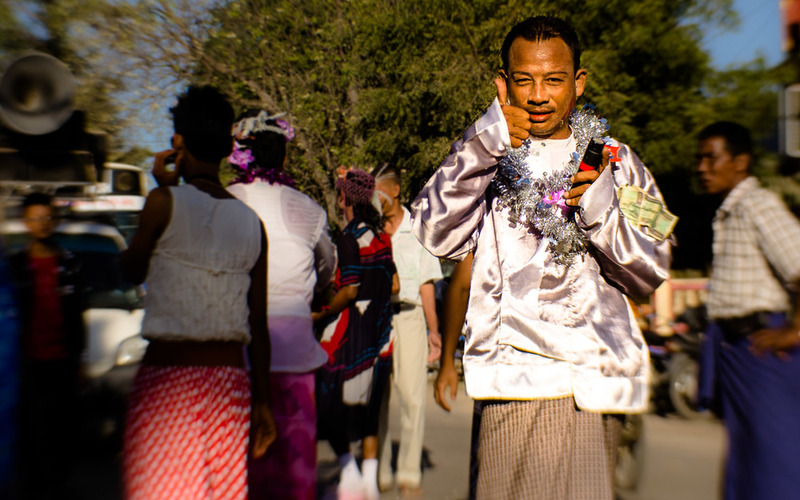 The celebration itself stretches for weeks, but after getting a fill of the nighttime gatherings on the grounds, the most interesting parts are actually the processions that come through the main street in the afternoons. Each day, a different quarter of the town is represented, and people from the neighborhood dress up in their best and walk through the long main street to the pagoda to make an offering. For the women and girls, this usually means dressing up, and choosing a bright parasol. They place a 500, 1000 or 5000kyat (~$0.50-$5.00USD) note on a stick, or pin it to their shirt, and walk a couple of kilometers through town to the pagoda. It's colorful and pretty, even if seeing some of them walk in high-heels on the broken street is cringe-worthy. You can't help but feel for their ankles that are seemingly just one misstep away from being detached from their foot thanks to that 3-4" heel stepping on cracked concrete and rocks. A row of women walk down the street as the procession moves toward Shwezigon Pagoda in Nyaung U, Myanmar (Burma). On the other hand, the young kids, boys and men are often up for something a little different. This usually manifests itself as dance troupes showing their moves to semi-choreographed routines ahead of a truck-mounted sound system screaming out the latest dance-pop tunes. Intricate face paint and matching outfits set the scene. A large, generator-powered mobile Myanmar boombox. 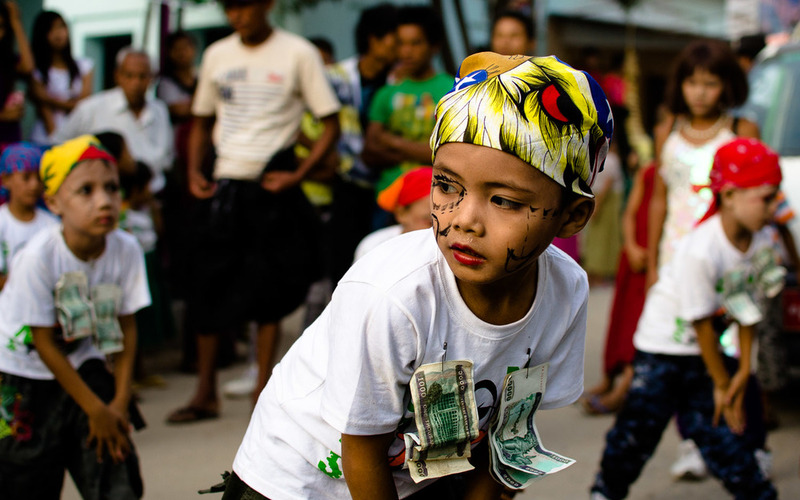 Young dancer showing his moves as part of the procession for the Shwezigon Pagoda Festival in Nyaung U (Bagan), Myanmar / Burma. 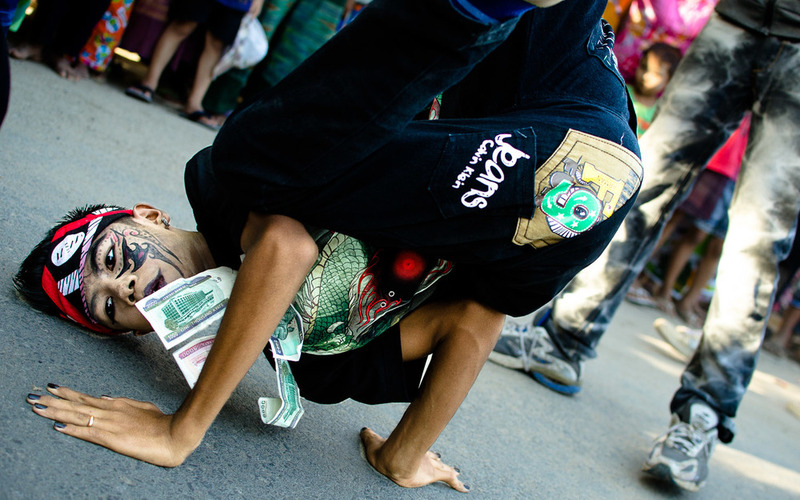 Break-dancing on the streets, with money pinned to the shirt to be given as an offering at the pagoda. The sound is a local song blasted in typical distorted fashion from the horn loudspeaker that is the norm in this part of the world. As usual, the sound is heavy on the reverb, which is obviously the favorite sound effect for the Burmese. And now the visual. A man dressed in a silver jacket complete with sparkling garland around his neck is singing a song to his girlfriend; his love. 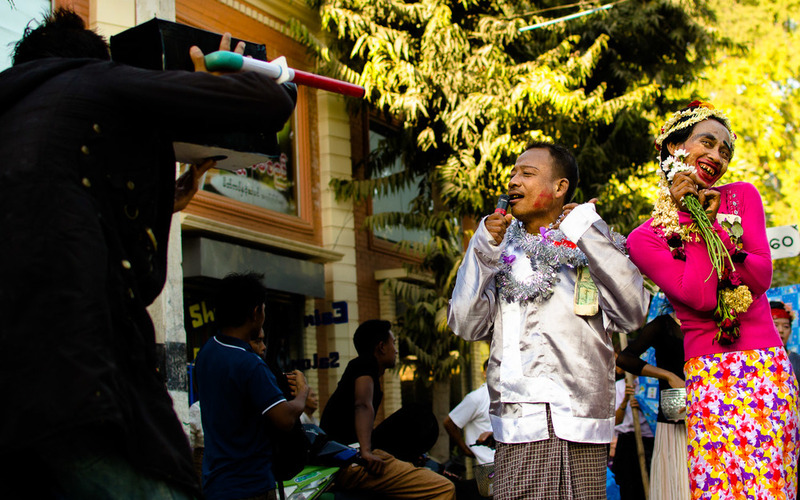 The protagonist in our story walks down the main street in Nyaung U, singing his heart out. He is flanked by a pair of cross-dressing men who sway side to side to the music, picking flower petals from a silver bowl and flicking them first left, then right as they slowly progress down the street. One of the flower girls. If you haven't figured it out already, this isn't your typical performance. The song is "Ma Pan Wee," and it is a new and popular song made in the more traditional Myanmar fashion, as opposed to the more western-style pieces that are gaining popularity around the country. This catchy song, that was described to me as a "dramatic song," is by the Myanmar singer Naing Lin Aung. or loosely translated to "Beautiful lady, give love to me"
The song is about a "sassy" lady who has many boyfriends. The thing is, this boyfriend doesn't like playing second (or third) fiddle, and it's getting him down. He's pleading to her to choose him as her one and only boyfriend. There's a faux film crew on this moving "set," manned by a pair of men who work in unison. Big glasses and wacky mustache holds a light reflector. The other, dressed in a black jacket with Korean-inspired spiky gelled hair holds a video camera; a black box with a blue plastic pipe that is always keenly focused towards the action. The song progresses, and then we finally see what it's all about. The lady who is the subject of the man's affection comes out from the back as our silver-dressed protagonist sings to her. Dressed in a long-sleeved pink top and flower-patterned longyi, head adorned with a wreath of pedals. Traditional thanaka on her cheeks, flowers in hand. Betel nut stained teeth, and the freakiest lipstick job you've ever seen. Her dancing, which is heavy on the arm and hand movements, is in the fashion that is traditionally popular in this part of the world. She sings along, but you can tell that she sometimes misses the words. Click on the photo above to check out the short video "Ma Pan Wee" in HD. He sings to her and she embraces him, laying a big wet kiss on his cheek, leaving plenty of lipstick behind as a gift and reminder. They sing together, dancing. He even gets down on one knee at one point to bat out a few lines, all the while looking up at her. Local "film crew" capturing the unique show. And with that, they continue walking past and down the dusty street towards the pagoda with their offerings, prepping their next performance for the onlookers on the next block. A few days later, I was showing some Burmese friends the video I shot, trying to get the story behind this. Their response? If you enjoyed this series, check out my other work on Myanmar / Burma, Asia, or my other photo stories from around the globe.